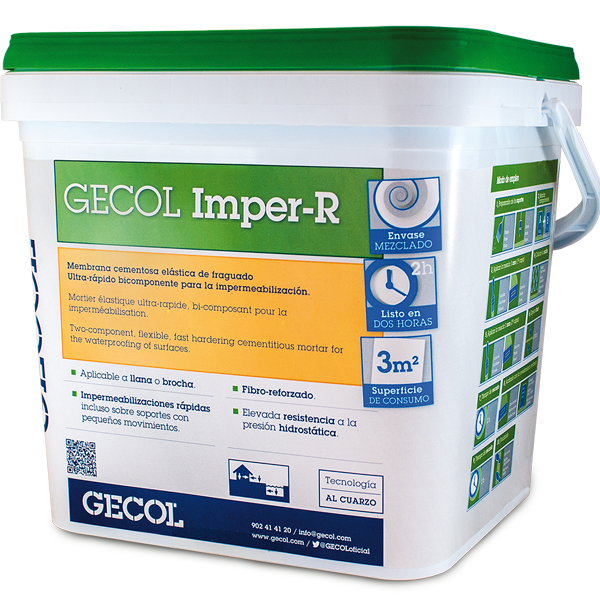 GECOL Imper–R is a two-component, elastic, ultra-fast setting cementitious membrane suitable for waterproofing and protecting concrete and other surfaces. Thanks to its ultra-fast setting (passable after 2 hours), allows the application of ceramic tiles and natural and/or engineered stones in areas subject to permanent dampness such us bathrooms, shower trays and toilets in industrial and public areas with recessed sinks. It is a reinforced-fibre membrane which has high resistance to positive and negative hydrostatic pressure. Designed specifically for waterproofing, including below the aquifer, its most common applications are for waterproofing swimming pools, pools, water tanks, fountains, etc. It can also be used to waterproof cracked walls and other surfaces subjected to major temperature changes. It can be easily applied by trowel, brush or roller, and can subsequently be covered with all types of mortar, ceramic tiles, paint, etc.